LONDON, UK London’s hottest milliner, Alexandra Harper Millinery announces third Disney collaboration to tie in with the release of the latest silver screen adaptation of Cinderella, set to premiere in UK cinemas on the 19th March. Harper has designed an enchanting micro range of headpieces as part of an on-going partnership with the world famous film company, capturing the magic of the well-thumbed childhood classic through an abundance of Swarovski crystals, silk and feathers. Women and children alike have coveted the timeless beauty of Cinderella’s iconic ball gown since the early 17th century. Instilled with just the right amount of fashion, Harper’s expertise and craftsmanship encapsulate the story to perfection in five statement headpieces. 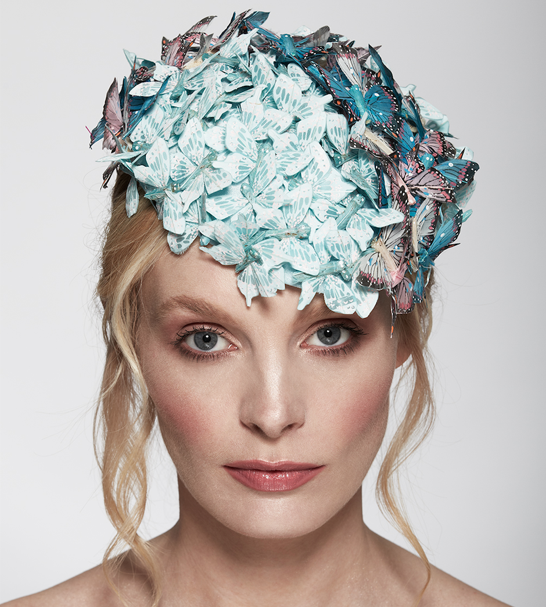 A mass of blue-hued butterfly wings flutter on a standout headpiece, ‘Ella’s Enchantment.’ Delicate Swarovski crystals and veiling adorn ‘Ella’s Innocence’ – a trademark, oversized blue silk bow. White hand-tooled silk leaves interspersed with carefully placed Swarovski crystals crown ‘Ella’s Perfect Ending’ – a small headpiece while swathes of pale pink flowers and coque feathers explode atop ‘Ella’s Garden’ – a mini silk pillbox. Tufts of tulle add a touch of finesse to ‘Ella’s Night’ – a clear, blue and iridescent beaded coronet encrusted with Swarovski crystals. Disney has enlisted some of the world’s most prestigious accessory designers to capture the grace of the new film featuring Lily James and Cate Blanchett as the lead stars. Harper sits in good company alongside Jimmy Choo, Nicholas Kirkwood, Alexandre Birman and Charlotte Olympia. Alexandra has and will produce several collections for Disney over a two-year period. The first was a collection inspired by ‘Maleficent,’ starring Angelina Jolie and Elle Fanning. The second was centered around Tinker Bell.